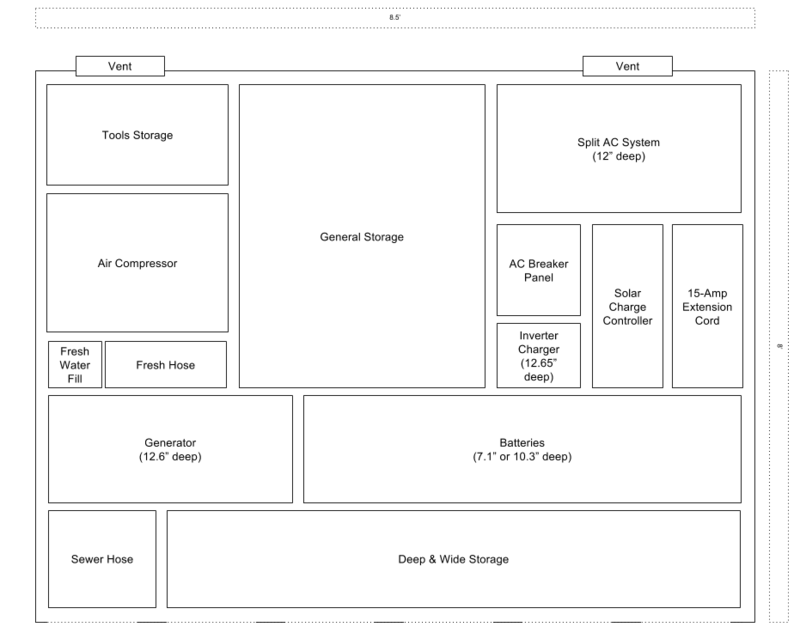 The image above (larger version) shows my planned solar panel wiring that will be on the roof of the RV. I wanted to work out exactly which connectors, how many, and what wiring methodology I wanted to use, plus exactly what parts would be needed. With the recent news that the wheel wells would be 12″ instead of 10″, I’ve reconsidered the height of my raised floor. 12″ was just a little more than I wanted, and something a bit less than 10″ would work pretty well too. Today I’m trying to figure out how high to have the windows. The 4 large windows are 48″ wide by 30″ tall, each. The smaller egress window is 30″ wide by 22″ tall. Here we’re seeing a rough layout (larger image) of the utility area, as it’ll be seen when opening the rear barn doors. The roof layout (larger image) is actually pretty simple. Since I’m not using a roof A/C unit, nor is there a TV antenna, it’s not too bad.